There are two types of players that leave for the KHL that the NHL should be concerned about. And no, players that have been reduced to journeyman status like Alexei Ponikarovsky, who just departed for SKA, aren’t one of them. The second are bright young prospects who leave for … well, the money plays a role, but there’s usually some underlying bitterness toward the reality of their NHL surroundings that plays into it as well. Alex Burmistrov, who left the Winnipeg Jets for Ak Bars last month, is clearly in that second category. He’s getting a raise to $2 million in the KHL, but the restricted free agent bolted, according to his agent, because he wasn’t happy with the Jets and coach Claude Noel. - Noel and the team refused to allow him to play in the KHL during the lockout, assigning him to St. John’s for a “learning experience” that, frankly, didn’t fill his wallet like a few months in Russia would have. 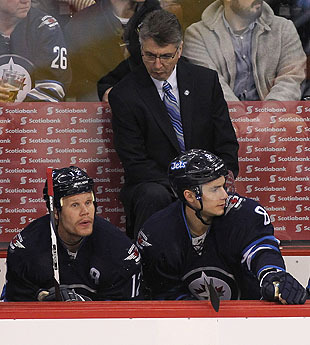 - Noel gave Olli Jokinen top-six minutes even though, in Burmistrov’s estimation, he wasn’t earning it. Burmistrov averaged 15:38; Jokinen averaged 17:07. Burmistrov averaged 0.23 points per game; Jokinen averaged 0.31 last season. So maybe he has a point. Or maybe 21-year-old forwards shouldn't try and coach the team. BUT THEY WEREN’T JOKINEN MINUTES, CLAUDE!! !